EJ Lee takes the first rest on the dock before final installation. We’ll ultimately have three docks: twin 6′ x 15′ science docks and one 10′ x 20′ main boat dock. We’ll build the second twin dock between May 15-May 17 (more here: https://www.facebook.com/events/730740727023245/) for the CUNY LaGuardia Community College environmental science program, one of our closest educational and ecological partners. That dock will float on Dutch Kills, where students are already working with Dr. Sarah Durand and Dr. Holly Porter-Morgan to study industrial impacts and prospects for habitat restoration. Our goal for the 10′ x 20′ dock is to have it complete by July 19, City of Water Day, to be used on Governors Island if needed before permanent placement at the HarborLAB GreenLaunch on Newtown Creek. With the season fast upon us, Executive Director Erik Baard decided that waiting for funding to purchase a prefabricated dock might result in delays that compromised safety and access for educational and environmental canoe and kayak programming. But HarborLAB volunteers had never built a dock. David Kistner of sponsor Green Apple Cleaners recommended getting a used dock. Erik agreed, reasoning that even a very rotted dock could serve as an outline to replicate with modifications. On Friday, the two went out to the Stony Brook Yacht Club, Long Island, for a dock that was kindly offered for free. David’s partner at Green Apple Cleaners, Chris Skelley, generously loaned his powerful pickup truck. The dock, described as 5′ x 26′, turned out to be 6′ x 30′. David backed a boat trailer into the water while Erik went into the chilly water to guide the giant dock onto the trailer’s rollers. Once ashore, David devised a masterful tie-down scheme to safely transport the giant, barnacle-encrusted and rotting monster despite wind sheer and vibrations. The dock was greeted in the evening with great skepticism by several volunteers, including Joe Block, Mairo Notton, and Alessandro Byther. As we considered our next steps, we removed mussels and oysters from the flotation billets and put them into the Newtown Creek rather than dry o dearth in the sun for days. Patricia was unfazed by the mechanics of what lay ahead, embracing the intellectual challenge. That work started on Sunday morning, with a morning crew of Emmanuel “Manny” Steier, Alessandro, Jenna Nugent, Phillip Borbon, and Erik taking to tasks at Patricia’s direction. We replaced deck boards immediately to stabilize the dock for deeper work. Most of the wood was replaced, braced, or otherwise reinforced. Old wood was cleaned of nails for reuse in our GreenLaunch’s raised bed gardens. Pat, Phil, and Erik worked into evening. By the end, the 30′ dock was halved and the first deck planking was done! A larger crew of builders and movers regathered on Tuesday, this time adding Mairo Notton (whose skills as builder were invaluable), his bright son, Tormi, EJ Lee, Pat’s son, Mike Menje, and delightful newcomers Alex Sramek and Aremi Ruiz. We completed all of the dock construction and recovered more wood for later use in the garden. Then Pat’s genius shown. One of the biggest, unsolved challenges was how to get the heavy dock into the water. Attempts to line up large mechanical help didn’t succeed. The dock was too hefty to lift, and once at the water’s edge, how would we get it safely in the water, face up? Pat had us saw the PVC piping inside the original dock (run through for water, electricity, and such at the Stony Brook Yacht Club) into sections to act as rollers. The dock moved easily, upside down along the street and the HarborLAB GreenLaunch’s earth. Pat identified and enhanced a ridge that, along with ropes, would allow us to control the dock for a final flip. Erik scheduled the dock launch to coincide with high tide on the Newtown Creek. It worked without a hitch! We attached cleats once afloat in holes we drilled ashore. Lovely Stonybrook, Long Island. Many thanks to the Stonybrook Yacht Club for their donation. A huge thanks to Chris Skelley and David Kistner of sponsor Green Apple Cleaners for respectively lending and driving the truck that made dock delivery possible. Green Apple Cleaners is the only cleaner in NYC using only methods recommended by the EPA (high tech water systems, captured CO2 with benign solvent). A huge thanks to Chris Skelley and David Kistner of sponsor Green Apple Cleaners for respectively lending and driving the truck that made dock delivery possible. Green Apple Cleaners is the only cleaner in NYC using only methods recommended by the EPA (high tech water systems, captured CO2 with benign solvent). David also masterfully strapped this large load. HarborLAB essentially replaced the dock piece by piece. The old dock served as an outline for a new one. The old wood will be used for raised bed gardens at the GreenLaunch. Here Patricia Menje Erickson takes volunteers through her plan. Bronxite and sailor, and HarborLAB volunteer, Phillip Borbon is ready to make the dream real! Emmanuel “Manny” Steier secured deck planks to stabilize the dock for further work. He also removed nails so that wood could be reused. 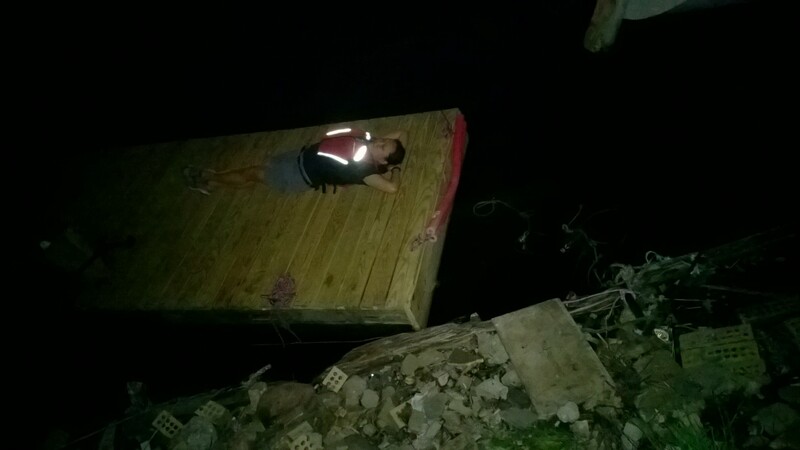 Philip Borbon cuts the original 6′ x 30′ dock in half. The twin docks will both increase access to the Newtown Creek for environmental work,, with one at the HarborLAB GreenLaunch and the other at the CUNY LaGuardia Community College science research site on Dutch Kills. Alessandro Byther and Erik Baard at work to replace deck planks and stabilize the dock for deeper work. Deck planks are all on! Still awaiting trimming, buttressing, and flotation. Patricia Menje Erickson and Phillip Borbon relish the fruits of their labor. They and Erik Baard worked until dark. Erik Baard, Patricia Menje Erickson and Phillip Borbon relish the fruits of their labor.. The second day brought a larger team. Here Patricia Menje Erickson, son Mike Menje, and Mairo Notton strengthen the sub-structure of the dock, adding boards and replacing rooted old wood. Order from chaos. And a happy Tormi. Mike Menje strengthening the interior of the dock. Alessandro Byther and other volunteers re-installed old flotation billets. City Tech student Aremi Ruiz prepared old boards to be reused in the HarborLAB GreenLaunch’s raised bed gardens. “What? Is something missing from our stairs? ” Some silliness set in. Alex Sramek, Tormi Notton, and Mairo Notton with the stairs they build with Erik Baard and Alessandro Byther. Patricia Menje Erickson’s genius in moving and launching the dock was something to see! Mike Menje admires the dock, a source of pride in his own work and his mother’s leadership. Erik Baard takes the unavoidable selfie. EJ Lee on the dock in the background. EJ Lee takes the first rest on the dock, after helping with moving and lowering, before final installation.